Lenovo has come out swinging at this year's CES 2014, with a number of products focused on the pros. Most important is the third-generation ThinkPad X1 Carbon, which Lenovo claims is now the world's lightest 14-inch ultrabook. Weighing just 2.8 pounds, the X1 Carbon is poised to be one of the most stunning ThinkPads yet. Lenovo brags that the laptop's name comes from its carbon fiber frame, which makes it lighter yet stronger than ultrabooks built from magnesium or aluminum. One of the more interesting developments in Lenovo's leading ThinkPad is the Adaptive Keyboard, a row of touch-sensitive, illuminated keys that change function and appearance depending on the active application. This could either prove to be truly helpful or just a gimmick, but it sure sounds cool. On the inside, the X1 Carbon's Haswell processor (up to Intel Core i7 with up to Intel HD Graphics 5000) powers Windows 8.1 behind an IPS display as sharp as 2560 x 1440 pixels. That's backed up by up to 8GB of RAM and an SSD as large as 512GB. Lenovo promises up to 9 hours of battery life from the X1 Carbon, which is also 802.11ac, Bluetooth 4.0, NFC and 4G LTE capable. Native Ethernet support, two USB 3.0 ports and full-size HDMI only sweeten the deal. The ThinkPad X1 Carbon goes for $1,299 (about £790, AU$1447) and is available now, as is the expected OneLink Dock Pro, which costs $179 (around £108, AU$199). We'll be sure to get hands on with this one, as it just might make the ThinkPad Yoga a moot point. Lenovo also announced the ThinkPad 8, a Windows 8.1 tablet aimed at the business crowd. Packing Microsoft's full Office suite, the ThinkPad 8 offers an eye-popping list of specs for an eye-gouging price. This 8.3-inch tablet is poised to be one serious slate, running with a quad-core, 2.4GHz Intel Z3770 (that's Bay Trail) chip. 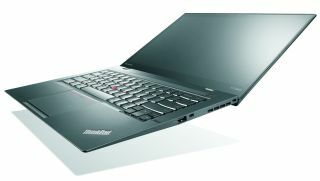 Coupled with 2GB of DDR3 RAM and up 128GB of storage–expandable via microSD–the ThinkPad 8 sports a 1920 x 1200, 10 finger multi-touch panel. Lenovo's first professional-grade tablet comes sporting two cameras: a 2MP shooter up front and an 8MP one around back, both capable of 1080p video capture. With all that (plus optional 4G LTE), Lenovo is claiming you'll get up to 8 hours of juice out of the ThinkPad 8. Finally, the company managed to squeeze a microUSB 3.0 port and microHDMI out on the slate. But, of course, Lenovo couldn't resist its trademark "modes" of use, made possible by an optional keyboard base (for Desktop Mode) and Quickshot Cover (for Tent Mode). The ThinkPad 8 will be available in the US starting late January starting at $449 (about £273, AU$500), which makes it quite a hard bargain against 10-inch tablets like the iPad Air. Regardless, we'll see how it stacks up during CES 2014 firsthand. Laptops, tablets and 4K displays, oh my! Last, but certainly not least, Lenovo pulled the curtain back on two new additions to its ThinkVision line of professional displays. Both panels offer 4K TV-level resolutions (3840 x 2160), but somewhat different feature sets for equally intense prices. First in line is the ThinkVision Pro2840m, a 28-inch screen that offers a bare bones experience. Not much beyond touch-sensitive buttons, dual speakers and a stand that tilts, swivels and rotates is on offer. Next up is the ThinkVision 28, another 28-inch panel that comes packing an Nvidia Tegra chip powering Android 4.3 and a number of additional features. Those features include 10 finger multi-touch interaction, NFC, Miracast support, an FHD camera for video, USB 3.0 ports and charging among others. And you'll certainly pay top dollar for all those pixels. The ThinkVision Pro2840m will be available in the US this April starting at $799 (around £486, AU$890), while the ThinkVision 28 will hit US shelves in July for $1,199 (about £730, AU$1335).